An extraordinary offer! The garnet is prized for its vibrant, red colour and its remarkable powers. It is thought to boost energy and revitalize an entire system while bringing stability and order to chaos whether internal or external. 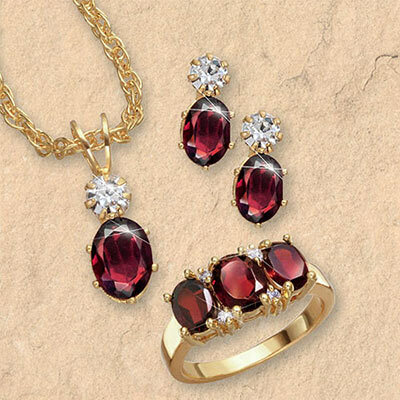 Our genuine Garnet jewellery Set is elegantly crafted of sparkling, faceted oval gemstones with crystal accents, set in a gleaming gold-tone finish. Set includes over six carats of garnets. Necklace: ½"l pendant on an intricate 18"l chain; Earrings: ½"l with post backs; Ring: three stones, ¾"w total.